The Dojo Pro "Dai-ichi" is easily the most serious, heavy duty production O-Katana (Nodachi/Greatsword) currently on the market. The massive 33" blade, forged from 1060 carbon steel in the Dotanuki style is optimized for the CUT and with 3.2lbs of weight behind it and a point of balance at 5.5" from the tsuba, is capable of the most powerful, shearing slices imagineable. 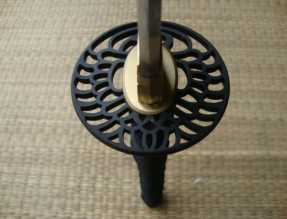 Like all the fittings of these swords, the tsuba - depicting a traditional crane - is solid iron, but so is the fuchi (band at the top of the handle) AND the kashira (end cap) – all acting in harmony to strongly reinforce the structural integrity of the entire handle in a way that is almost never seen on other swords under the $500 price point (nevermind on swords under $300!). The saya (sheath) itself thick and made from dense, high quality wood, after all you don’t put hand cut and polished buffalo horn Kurikata, Koguchi and Kojiri on an inferior saya. The sword came in a timely fashion, well packaged and protected in two boxes, came with a black exterior and white interior sword bag. First impression was marvellous, the sword feel heavy ( what I was looking for ). The sageo has a nice "intertwines" design and is just as pictured. No lose piece at unboxing, nor after a intensive drill with it. Everything is solid in place. The sword came sharp ( the box it came in agree ) and straight, in perfect condition. No visible scratches on the blade, it was very well covered in museum wax. Bits of wood particles were loose in the saya that stuck on the blade, but after a bit of cleaning it was perfect. there's is one visible "scratch" on the saya near the open end, I failed to identifies if it was a intended design pattern or a real scratch as it does not completely do the whole circumference ( but almost). Barely visible and sure isn't a reason enough to complain. The hamon is slightly visible, it has a shadow design, so at first glace you'd think the blade has none. This is also a No-hi Model, resembling a lot the blades from Cold Steel. The blade is tight in the saya, it doesn't come out without us calling for it. The Ito wrap around the tsuka is tight as a vir-... never mind, it's awesome. The menuki ( ormament ) are where they are supposed to be and solid in place. Tsuka and kashira are rust-free ( they are iron if I am not mistaken ) and if I may add, beautiful. 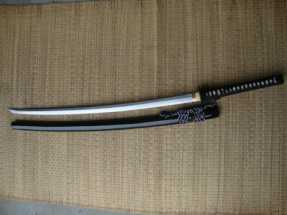 As for the general feeling of the blade, it is obviously heavy compared to a normal Katana. 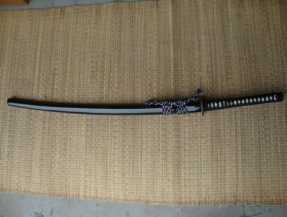 The length of it is also to not take too lightly, it has a serious reach upgrade if you're used to a 27 to 29" katana. The cuts are impressive and clean, it cut in paper like a thousand $ blade out of the sharpening workshop. Haven't yet tried against Bamboo sticks or normal cutting targets, but I'm pretty confident to say that the outcome will be satisfactory. In conclusion, I would recommend this O-katana to every serious practitioner of a serious size who feel like the normal katana is just too tiny for them. It require a lot of experience with a blade and some serious practice to be able to use it correctly and safely, as such, I wouldn't recommend to someone who has no experience wielding a normal katana. You need also to consider your built type before buying this, a larger person might find a beautiful handling in this blade with a bit of practice, but a normal sized or smaller body type will find it extremely difficult to have a satisfactory outcome with this blade, if you consider yourself to be in those two body type, please make sure to have serious training before buying one of those for actual cutting or practising. For the collectors out there. This is also a very nice piece to get.